The February issue of NARC. is available now, from over 200 outlets across the region. We’ve got a packed issue for you this month, with a newly extended Culture section, and even more interviews and reviews to get stuck into! 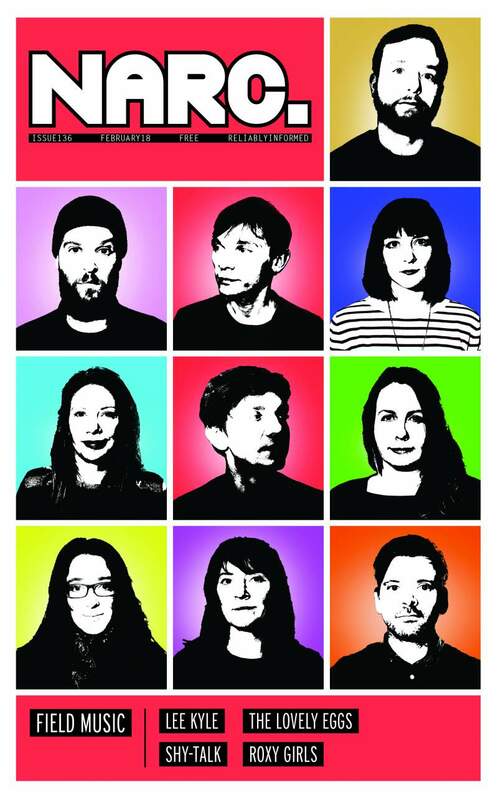 Our cover stars are Wearside pop wonders, Field Music. Ben Lowes-Smith talks to Peter Brewis about Field Music’s most emotive, expansive and democratic record to date ahead of their orchestral gig at Northern Stage. News-wise, it’s a busy ol’ month. Check out the Waveform Alldayer in Saltburn; Black Moth at The Cluny 2; Rat Boy at O2 Academy; First Wave showcase at Georgian Theatre/Ku Bar; Don Broco at Northumbria Institute; Raised By Owls at Little Buildings; Richard Dawson at Redhills Durham; Shut Down hip-hop showcase at Independent; Elephant Memoirs at Little Buildings; Alcohol Fuelled Violence at The Cumberland Arms; The Xcerts at Georgian Theatre and much more. Our new Culture pages are brimming with greatness including an interview with comedian Lee Kyle about his new tour; we profile comic Sophie Willan, who performs at ARC/Northern Stage and we chat with filmmaker Cecilia Stenbom ahead of a screening of her new work at Tyneside Cinema. We also check out Poetry Pioneers: 35 Years at ARC; The Department of Distractions at Northern Stage; Hedda Gabler at Theatre Royal; Shappi Khorsandi at ARC; Sean Scully at Hatton/Laing Art Gallery; Black Men Walking at Northern Stage; Stuart Maconie at Sage Gateshead; Hilarity Bites at Hole In The Wall; Andy Zaltzman at The Stand; new exhibitions at BALTIC; Cody Sowerby at Abject Gallery; plus there’s reviews of Looking For Lenin at Side Gallery; Jessica Fostekew at The Stand; There But For The Grace Of God (Go I) at ARC and more besides! Our interview section is as chock full as always too. Linsey Teggert talks to rock trio Arcane Roots about bringing new elements into their already established sound; Laura Doyle talks to new Sunderland trio Roxy Girls about their debut release; Leigh Venus talks to Franz Ferdinand’s Bob Hardy about producer gurus, a new line-up and the role of politics in music; Robert Nichols talks to honey-toned North Yorkshire songwriter George Boomsma about his new album; ahead of a headline show at The Head of Steam this month, Mark Corcoran-Lettice talks to the art-punk pranksters of Shy-Talk; Becca Fergus talks to quirky DIY duo The Lovely Eggs about their new release; Ali Welford speaks to Mogwai main-man Stuart Braithwaite about scoring for films, returning to the live stage and performing in Hiroshima; ahead of their upcoming Newcastle gig, Joe Fowler talks to The Go! Team’s Ian Parton about the making of their fifth album, Semicircle; and Claire Dupree talks to multi-cultural ‘meld’ pioneers, MetaQuorum. Plus, our Mixtape is chosen by Allan Scorer from Little Buildings/Truth Hurts Promotions. Review-wise, we feature demos by The Clarions, Kosmonaut, Escape To What, The Adlets and Holly Rees; albums from Hookworms, Ezra Furman, GoGo Penguin, DZ Deathrays, The Soft Moon and more; singles by The Radio Set, Velvoir, Indigo Vertebrae, Dose among others and there’s live reviews of Cape Cub, Slow Decades, Blown Out, Duds, Sextile, This Is The Kit, Lucy Farrell, The Deslondes and many more.